Food delivery company has been condemned online for its campaign advertising rare animal meat for sale, but reveals it is part of a wider strategy to raise awareness of endangered species. Singapore-headquartered startup Honestbee has come under fire for what looks like a promotion offering customers the option to purchase exotic and endangered meats. "After months of scavenging, negotiating and sampling, Honestbee has finally managed to get Explorer Joe Exotic Meats onboard as one of our boutique fresh meat merchants," reads the blog post by the company introducing the new merchant. "We are excited to introduce the variety of exotic wildlife meats that they carry. These meats are fresh, rare and unbelievably good." Exotic meats on offer include Minke whale meat, bamboo-fed panda, koala sausages and komodo dragon eggs. People have expressed their displeasure at the campaign, which began on 29 March on the company’s Facebook Page. Many assume it to be a potential April Fools prank, calling it "distasteful" and an "extremely tasteless joke", with additional calls to boycott the company. 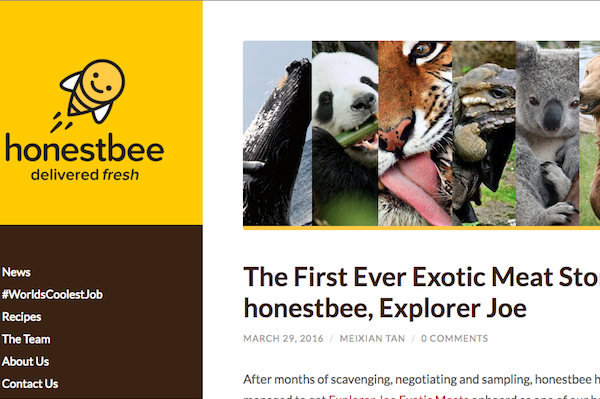 Speaking to PRWeek Asia, Honestbee’s head of communications Shane Chiang said that it was a marketing campaign and not an April Fools prank. The campaign is being run in Singapore, Taiwan and Hong Kong. "We know that many people are upset and rightly so. We would like to say that none of it is real and that no exotic animals were actually harmed," he added. The grocery delivery startup urged the public and its customers to wait for the campaign's "meaningful ending", which was slated to be revealed on Friday, 1 April. However, Honestbee brought forward the unveiling by one day, perhaps in response to the public outcry over its campaign. On 31 March the company released a statement outlining the campaign's true purpose to raise awareness of illegal wildlife trading. "Yesterday, you awoke to an email update about honestbee partnering with Explorer Joe Exotic Meats store. This store featured a variety of different endangered species like Pandas, Tigers and Whales seemingly packaged for consumption," the statement reads. "The idea that these animals that are on the brink of extinction and yet readily available was probably disturbing to all because even all of us here at Honestbee were similarly upset. It was always our intention to drive deep meaningful conversations around this subject." Asked about the backlash the campaign garnered from so many netizens, Chiang shared that when the campaign was still on the drawing board, concerns were raised internally about the potential hate. "We accepted the potential risks involved with executing such a campaign but decided that we were going to do it, and do it right," he added. However, some consumers still remain critical despite the unveiling of the campaign. One Facebook comment decries Honestbee's actions as "just attempt[ing] to create a marketing buzz" with "shallow ads".